1) Even where some Iraqi officials attempt to assist Iranian refugees, they are threatened with the use of force by officials of the Islamic Republic to co-operate in this illegal activity. Judges, attorneys, and UN officials have also been threatened for trying to help Iranian refugees. 3) Pressure has also been exerted on Iranian refugees’ family members elsewhere, including in Iran, in an effort to compel Iranian asylum-seekers in Iraq to return to Iran. Five Iranian asylum-seekers have been returned to Iran under suspicious circumstances. One was detained immediately upon their return for 48 hours by the Islamic Republic’s Intelligence Agents and was reported in poor condition when released. Three other asylum seekers were either handed over to the Islamic Republic’s security agents or physically forced to return to Iran where they are now in prison. There have also been reports in Kurdistan, Iraq of other such forced returns by security forces. If you need to flee Iran, avoid going to Iraq if you can. Iraq is not safe for Iranian asylum-seekers and your rights will not be upheld by either UNHCR or the local or national government. UNHCR in Iraq is not recognizing refugees, in some cases is not registering refugees (specifically in Suleymania), and despite their mandate will not assist with housing, health care, education for children, work, or resettlement to a safe third country. Iranians crossing the Iraqi border illegally, or without papers, are subject to prison sentences of more than 5 years followed by deportation to Iran. In particular, Iranian Ahwazis fleeing Iran should avoid crossing into southern Iraq. If you are arrested prior to reaching a UNHCR office you will be immediately imprisoned. This information is based on actual cases in which we have been involved. We recommend that, if possible, you travel to Turkey, where you should report to the local UNHCR office as soon as possible. Services to support Iranian refugees are more developed there, and you are also more likely to be able to get access to assistance from non-governmental organizations (NGOs). If you are able to flee Iran by air, we further suggest that you attempt to enter a European country and apply at the UNHCR for asylum there. If Iraq is your only option to escape the Islamic Republic, note that the most dangerous areas for asylum seekers and refugees are Basra and Maysan Province in southern Iraq as well as Kurdistan, Iraq in the north. We also recommend that Iranians in Iraq do not attempt to go to Syria, as the Syrian authorities will immediately hand you over to the Islamic Republic. Note that the UNHCR office in Suleymania cannot be considered functional – it is frequently closed, and even when “open,” many asylum-seekers attempting to register at the UNHCR office in Suleymania have been turned away, leaving them exposed to arrest, detention, and deportation to Iran. After successfully reaching and registering at a UNHCR office you are entitled to certain rights; while Iraq is not a signatory to the 1951 and 1967 UN Convention on the Protocol Related to the Status of Refugees, UNHCR (the UN Refugee Agency) is at least nominally functional in Iraq and at least its staff are required to abide by the standards laid out in the Convention and Protocol Related to the Status of Refugees, a copy (in English) of which may be downloaded from UNHCR. Iraq itself, however, has its own refugee law, called the Political Refugee Act , No. 51. (3) Please ensure that, either before leaving Iran, or as soon as possible afterwards, you investigate your rights as an asylum-seeker under these rules and laws. If you are unsure or unable to do so, please get in touch with a trustworthy local NGO or other organization such as those active with the International Coalition for the Rights of Iranian Refugees (listed at the bottom of this document). If you are being denied these rights or are being mistreated in any way, please tell an active advocacy organization as soon as possible, in addition to reporting the violation to the Inspector General at the UNHCR (inspector@unhcr.org). When you report rights violations to human rights or refugee rights organizations, we can get the information to the appropriate authorities or protection agencies and advocate for you. This is an important step in documenting your case and your complaints, and it helps others learn about the situation on the ground in Iraq; however, it should be noted that the situation in Iraq for Iranian refugees is so bad that it is difficult to generate action for anything less than life-threatening situations or imminent deportations of known activists to Iran. Even refugees facing life-threatening situations in Iraq have had to endure them for months while advocates have tirelessly worked for a solution to their grave circumstances. We recognize that many asylum-seekers who flee from Iran to Iraq are social activists who demand that their rights to free speech and public assembly be upheld. We support those demands. However, for activist Iranian asylum-seekers in Iraq in particular, we recommend that you pay extreme attention to your personal safety and security. Iraqi authorities and representatives of the Islamic Republic have taken the opportunity to identify Iranian activists at public actions and then target them for subsequent arrest and deportation. We therefore recommend that activities that expose you to the authorities should be avoided. For asylum-seekers needing additional information or inquiries, please contact icri.refugees@gmail.com. (3) Political Refugee Act, No. 51, Official Gazette No. 1985 (Apr. 10, 1971); please see excerpted text below. 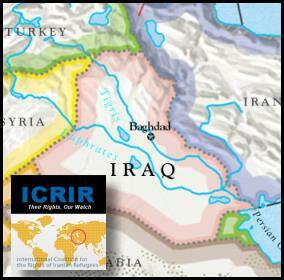 Excerpted from UNHCR’s COUNTRY OF ORIGIN INFORMATION: IRAQ regarding refugee law in Iraq. The protection of refugees is governed by the 1971 Political Refugee Act (Law No. 51 of 1971, hereafter Refugee Act), the 1978 Law on Foreigners Residence (Law No. 118 as amended by Law No. 2 of 1980), provisions from human rights treaties of relevance for the protection of all individuals (including refugees) and by revised CPA Order No. 16 of 13 June 2004 on the Temporary Control of Iraqi Borders, Ports and Airports (see below for more details). The 1971 Refugee Act was approved by the then-RCC and superseded Iraq’s 1959 Refugee Law. According to Article 1(3) of the 1971 Refugee Act, a refugee is: ‘Every person who seeks asylum in Iraq for political or military reasons.’ By virtue of this law, recognition of refugee status was the responsibility of the Permanent Committee for the Political Refugee Affairs, a body created by the 1971 Refugee Act. After the fall of the former regime, the Permanent Committee no longer met, not least because its Head was dismissed. However, there is no official information available as to whether the Permanent Committee for the Political Refugee Affairs was officially dissolved. Since the Ministry of Displacement and Migration is now the competent body to deal with the protection of refugees, it would also be responsible for granting refugee status. The principle of non-refoulement is guaranteed in Article 4 of the 1971 Refugee Act and reconfirmed by the TAL (Article 19). While Article 4(1) of the 1971 Refugee Act stipulates that ‘under no circumstances shall a refugee be handed over to his state,’ Article 4(2) stipulates that ‘if the application of an asylum-seeker is rejected, the person may be deported to a country other than his country of origin or as would be found appropriate by the concerned authorities and with the approval of the Minister’ (i.e. Minister of Interior). Article 14 TAL (Transitional Administrative Law) guarantees that each individual has the right to education. Article 11 of the 1971 Refugee Act provides for refugees’ equal access to schooling. The TAL does not include the right to work. Refugees are entitled to work (under Article 11[b] of the 1971 Refugee Act), however given the unstable security situation and the difficult economic conditions in Iraq, Iraqis and refugees alike suffer from unemployment.